Attention everyone! 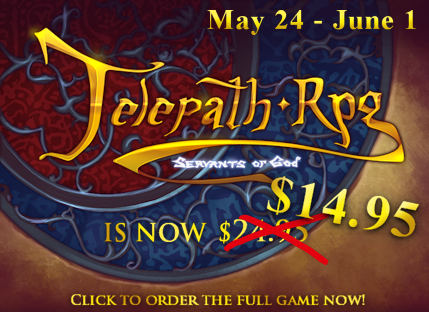 Starting on May 24th–for one week only—Telepath RPG: Servants of God will have its price hacked nearly in half. Seriously, this is a pretty massive discount, and it’s not one that I’m likely to offer again anytime soon. So! If you’ve been hovering around, waiting for a sale, this is your chance. Go ahead and do it. Why the discount? Because We May. This entry was posted on Wednesday, May 23rd, 2012 at 12:02 PM and is filed under Fan Stuff, Sinister Design News. This post is tagged Because We May, sales, Telepath RPG: Servants of God. You can follow any responses to this entry through the RSS 2.0 feed. leave a response or trackback from your own site.